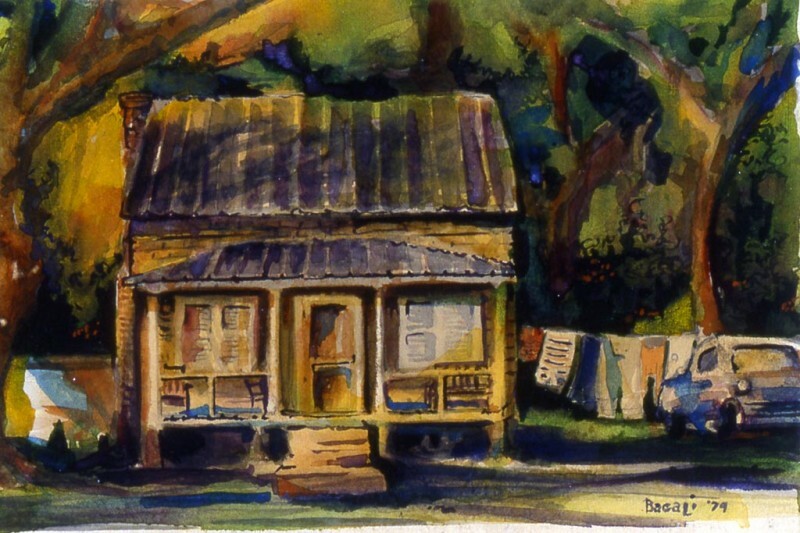 One of the first paintings I ever did was the little one of Miss Lydia’s house. I gave it to her for Christmas in 1979. She and the kids got a kick out of the clothes hanging on the line out back. They recognized Craig’s pants. I can still hear Miss Lydia’s high, squeaky laugh that is so characteristic of her. That was long before I knew Eleanor or Rob or even before Rob’s kids were born. Miss Lydia lived across the street and Big John and Evalyn lived next door to them. John was Lydia’s son. One of her eleven children. Big John got his name for obvious reasons. Only his laugh was bigger than he was. We put him in the back of our convertible VW bug and drove around. It was fun. He’s passed now. Heart attack, I think. Evalyn’s gone, too. When I first moved to Wadmalaw I really enjoyed all that activity across the street. We lived in the fork in the road behind the old Cone’s Grocery Store. It was a busy corner. Too busy. Like the night that Chevy landed on our front porch. But that’s another story. Evalyn used to come out just a shoutin’ at those kids and that Miss Lydias house booming voice of hers would blow them right out of her yard and into Grandma Lydia’s. I used to go to my screen door and listen to her. Boy, was she mad. I would squint my eyes and squint my ears and listen so close and I still couldn’t understand a word she was saying. It became a game with me. I’d hear her and go to the door, just sure if I listened close enough I’d figure it out. I couldn’t understand how she and I could sit on my front porch steps with Sharon and Edith and Julie, chit-chatting all the time but when she yelled at those kids I couldn’t make head or tails of it. I hadn’t heard about Gullah just yet. Edith would call her from Miss Lydia’s house. “Ev -a- lyn!” Always three syllables with the emphasis on the third. Try it, it’s fun. Ev – a – lyn! Edith’s all grown up with kids of her own now. Like I say, Evalyn’s gone. She was just a wisp of grass when she left us. I borrowed the painting back to have it photographed. It was kind of moldy so I cleaned it up and framed it for her. I need to take it back but it so reminds me of those Sunday afternoons after church when the whole family got together, two households, two front porches. The elder gentlemen sitting together around the table on the screened porch in their Sunday best, somewhat murmuring until they erupted in laughter. Like men do when they’re telling a “good story” the kids don’t need to hear. Just like my uncles back home. And I would sit on my front porch, behind those tall crape myrtles and I would have to smile. I was so lonely. My family was so far away. How I wanted to go over and be a real part of it. But I was a real part of a family of crazy Italians and somewhere, at someone’s house this Sunday they were doing the same thing. So I would take a deep breath and go paint a picture. Craig and Edith are all grown up and Miss Lydia doesn’t see too well anymore. I did return the painting but I kept the memories.